Tracktion has a new home on the web. NAMM 2013: Some of you may be able to remember Tracktion, an 'underground' DAW that became popular in the early-to-mid noughties. This was was sold to Mackie in 2003, but after almost a decade, it's been sold back to original developer Julian Storer and two other former Mackie employees who've formed Tracktion Software Corporation. The good news is that this means we now have Tracktion 4, an updated version of the DAW that has a re-written engine that's optimized for the latest operating systems. You can download a demo and find out more at the new Tracktion website or in the press release below. Mackie today announces the sale and transition of Tracktion Music Production Software to the Tracktion Software Corporation (TSC). TSC is led by three principals; Julian 'Jules' Storer, the original creator of Tracktion as well as former "Mackoids" James 'Woody' Woodburn and Dave Christenson. "With Mackie's continued focus on creating innovative hardware solutions, the choice to transition Tracktion to TSC was clear," said Matt Redmon, Mackie product manager. "TSC is fully dedicated to the development, support and marketing of Tracktion. Their experience with the DAW market and intimate knowledge of Tracktion made them the perfect group to take Tracktion into the future." Tracktion is a fantastic platform that offers a radically easy approach to composing, recording, editing, mixing and sharing music on a Mac or PC. Based on a simple single-screen interface, Tracktion is the fast, powerful and complete solution for music production at any level. "We are proud to announce not only the acquisition of Tracktion Music Production Software, but that Tracktion 4 is available immediately," remarked James Woodburn of Tracktion Software Corporation. "New and existing users can download the powerful new software today and start working on their next project." Tracktion 4 will be made available via the Tracktion website (www.tracktion.com) during the 2013 NAMM show. 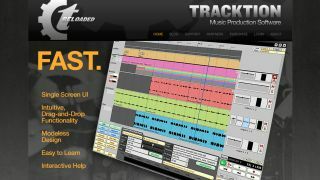 This latest version builds on the popular features of Tracktion 3, however, with a significant upgrade. The Tracktion engine has been completely re-written such that it is now fully optimized for the very latest operating systems - both Mac and PC - along with 64-bit processing, WMA, AU and WASAPI support. This allows Tracktion to run extremely efficiently on a wide range of computers - allowing the user to get the very best performance from their system - a big plus given that Tracktion is a completely unlimited application. As the new owner of Tracktion, TSC now also manages www.tracktion.com, the new source for Tracktion product information and application download along with product resources and a dedicated Tracktion user forum. As of January 24th, customers purchasing a new Mackie product that includes Tracktion can download Tracktion 4 immediately. There will also be an upgrade path for existing Tracktion users via www.tracktion.com.